Derwin James Kah Wai Mak (麥家瑋), O.St.J. Coat of arms with supporters for use in France, Spain, Germany, and Russia. Gules, on a bend Sable fimbriated Or between in chief a bezant pierced square and in base a maple leaf Or a three clawed Chinese dragon passant Argent langued Gules. Gules, on a bend Sable fimbriated Or, between in chief a bezant pierced square and in base a maple leaf Or, a Chinese dragon passant Argent, langued Gules. Upon a helmet mantled Gules doubled Or on a wreath Or and Gules an Eagle rising Sable beaked armed and membered Or grasping in the dexter talon a Key ward upward dexter also Or. An eagle rising, wings elevated and displayed Sable, armed and membered Or, grasping in the dexter claw a key erect of the last. Wreath and mantling: Argent and Gules. Supporters: Dexter the Goddess Diana clad in a short tunic Bleu Celeste holding a wooden bow proper in her right hand, sinister a Chinese Qin Dynasty general clad in a tunic Vert, armour Sable, and helmet and boots Brown, both standing on a compartment of grass Vert charged with eight white trilliums proper. A sun of twelve rays four straight and eight wavy set alternately Or quarterly pierced at the centre. Standard: A standard, in hoist the Arms granted to him by the Chief Herald of Canada on the 20th day of March 1990 adextré Argent the phrase 變異或死亡, meaning "Mutate or Die", inscribed in Chinese characters in pale Sable, the fly per pale Argent and Gules charged with the Crest granted to him on the same date and the Badge granted to him by the Chief Herald of Canada on the 4th day of March 1996. Supporters assumed, December 17, 2011. Motto assumed, October 24, 2013. Grants: Arms: Canadian Heraldic Authority, The Public Register of Arms, Flags and Badges of Canada, Volume II, page 10, March 20, 1990. Badge: Canadian Heraldic Authority, The Public Register of Arms, Flags and Badges of Canada, Volume III, page 122, March 4, 1996; Standard: The Public Register of Arms, Flags and Badges of Canada, Volume VI, page 631, July 16, 2016. Registrations: Arms: Bureau of Heraldry (South Africa), registration certificate 2148, February 9, 1990. Badge: Bureau of Heraldry (South Africa), registration certificate 2363, October 4, 1991. Standard: Bureau of Heraldry (South Africa), registration certificate 3894, June 18, 2017. Library of Congress, U.S.A., copyright registration, certificate no. VAU 124-760, September 28, 1987. American College of Heraldry, U.S.A., registration number 893, The Heraldic Register of America, Volume Five, June 4, 1990 (shield, crest). Augustan Society, registered on May 4, 1991, certificate issued on January 2, 2016.
International Register of Arms (formerly known as Burke's Peerage and Gentry International Register of Arms), U.K., registration number 0202, September 14, 2011 (shield, crest). United States Heraldic Registry, U.S.A., registration number 20130804A, August 4, 2013 (shield, crest). Derwin Mak is a chartered accountant, an Officer of the Most Venerable Order of Hospital of St. John of Jerusalem, and a Vice-Chair of the Library Committee of the Royal Canadian Military Institute. He has Master's degrees in Accounting (University of Waterloo) and Military Studies (American Military University). Brereton C. Jones, Governor of Kentucky, commissioned him as an honourary Colonel and aide-de-camp on the Governor's staff. He is also an author of science fiction novels and stories, one of which, "Transubstantiation", won the Aurora Award, Canada's national award for science fiction. His website is www.derwinmaksf.com. 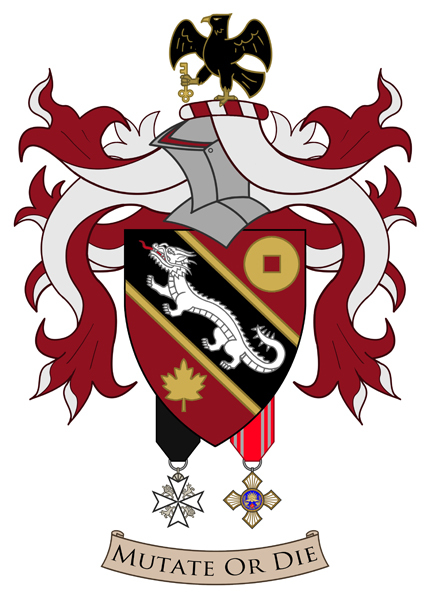 Mak designed and assumed these arms as a university student. When the Canadian Heraldic Authority was established, he petitioned for the arms to be granted to him. He became the second Chinese Canadian to receive a grant of arms from the Canadian Heraldic Authority, preceded only by the Hon. David See-Chai Lam, Lieutenant Governor of British Columbia. The arms' colours combine the traditional colours of China (red and gold), the German Empire of 1871 to 1918 (black, white, red), and Canada (red and white). The German Imperial colours and the black eagle are symbols of Germany, referring to Mak's home town of Kitchener, Ontario, which was known as Berlin before World War I. The eagle holds a key, a medieval symbol of accountants. 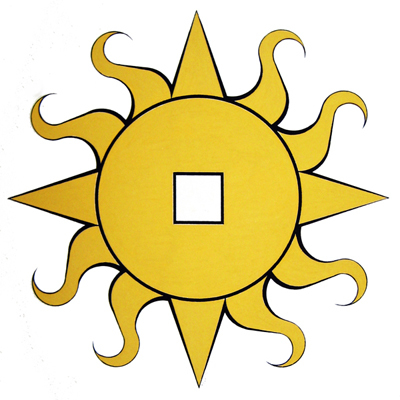 The "bezant pierced square" resembles an old Chinese coin, another symbol of Mak's accounting profession. The dragon is another symbol of China, and the maple leaf is a symbol of Canada. The blazon of the arms developed and registered by the South African Bureau of Heraldry differs slightly from the Canadian blazon in that it: specifies the mantling to be red and white instead of red and gold; and it does not specify the number of claws on each paw of the dragon, so the dragon can conceivably be drawn with four claws per paw. The illustration shown here is drawn by artist Tina Olah according to the South African blazon. Ms. Olah's illustration shows two of Mak's decorations suspended from the shield: the decoration of an Officer of the Most Venerable Order of the Hospital of St. John of Jerusalem and the Golden Order of Merit of the Japanese Red Cross. Mak designed his badge by combining the Chinese coin from his coat of arms with the sun in splendour, a European heraldic device. The badge is also reminiscent of another Chinese symbol, the twelve-ray sun that is the national emblem of the Republic of China. Although the Canadian and South African blazons have different wording, they both describe the same badge. In 2011, the Russian College of Heraldry informed Mak that Russian tradition entitled him to augment his coat of arms with supporters because he is an honourary military officer and member of an order of chivalry. In addition, some European heraldists told him that armigers could freely assume supporters in Germany, France, and Spain. On December 17, 2011, Mak assumed supporters for use while visiting the above countries. The left supporter is the Goddess Diana holding a bow. Diana is goddess of the Moon and symbolizes Mak's science fiction writing, especially his first novel, entitled The Moon Under Her Feet. The right supporter is a general of the Qin Dynasty and wears a uniform seen on officers of the famous terracotta army of the First Emperor. The General represents Col. Mak's interest in military and Chinese history. The two supporters stand on a grassy compartment with eight white trilliums, the symbol of Ontario. 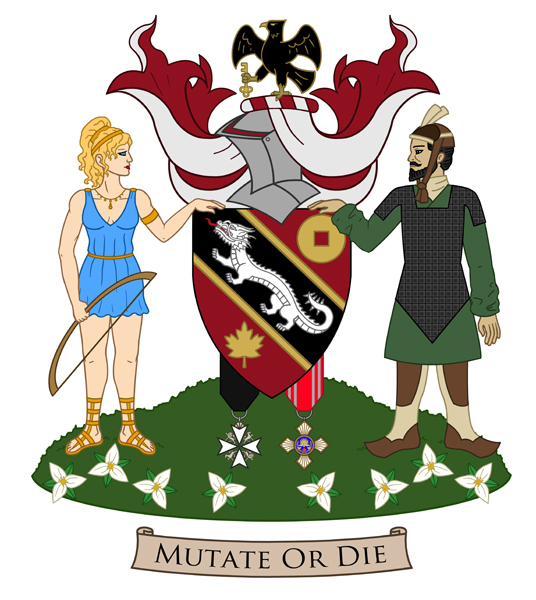 Derwin Mak assumed the motto “MUTATE OR DIE” for his coat of arms on October 24, 2013. The motto is the title of an essay that he wrote for Enlightenment, the journal of the Doctor Who Information Network, in the 1987. The essay’s title was inspired by the title of the speech “Mutation or Death”, delivered by future science fiction editor Donald A. Wollheim for science fiction fan John B. Michel at the Third Eastern Science Fiction Convention in Philadelphia, October 1937. Despite the similarities of titles, Mak’s essay and Michel’s speech have nothing in common. Mak was condemning boorish behaviour at Doctor Who fan conventions, and Michel was advocating for left-wing political activism among science fiction fans.